Located beachfront and offering the perfect escape for a memorable vacation, the Barcelo Ixtapa Beach features a Kids Club, live entertainment and a variety of water sports. Relax in deluxe accommodations, sip margaritas by the pool, exercise in the fitness facility or participate in a fun cooking class. Located beachfront and offering the perfect escape for a memorable vacation, the Barcelo Ixtapa Beach features a Kids Club, live entertainment and a variety of water sports. Relax in deluxe accommodations, sip margaritas by the pool, exercise in the fitness facility or participate in a fun cooking class. This Pacific Coast resort also offers nearby golf, buffet and à la carte-style dining venues, as well as Club Premium options. Along the stunning Pacific coast of Mexico, the all inclusive Barcelo Ixtapa Beach is the perfect oasis for unforgettable couple or family vacations. Featuring nightly entertainment, a kids club, countless beachfront sports and activities, savour a complimentary cocktail, try your hand at some cooking classes or simply take a dip in their refreshing outdoor pools. This hotel has an activity that caters to each traveller’s unique needs and tastes. 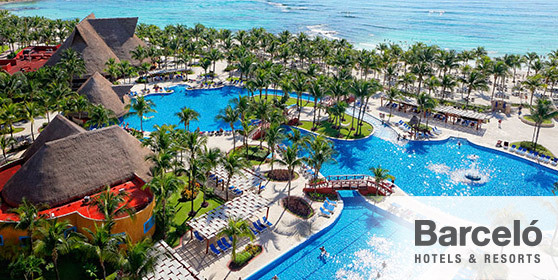 Barceló resorts offer an ideal All-Inclusive for families, adventurers, recreation enthusiasts and pleasure seekers. Experience an impeccable vacation in Aruba, Costa Rica, Cuba, Mexico and the Dominican Republic.